First edition of János Thuróczy's (Latin: de Thurocz or Thwrocz) Hungarian Chronicle. The first part is based on earlier manuscript chronicles and the first printed Chronica Hungarorum (Buda 1473); it comprises the beginnings of Hun and Hungarian history until 1386. The final part, the description of the last century, Thuróczy composed himself using his own research from chancellery records. 281 x 195 mm. – 168 leaves. With 42 woodcut illustrations (1 full-page) in contemporary colouring. Thuróczy wrote the Chronica Hungarorum in 1486-1487. The latest event mentioned is Matthias Corvinus's conquest of Wiener Neustadt on 17 August 1487. Only seven months later, the chronicle appeared in print, this short period suggesting that the edition is probably based on Thuróczy's original manuscript. 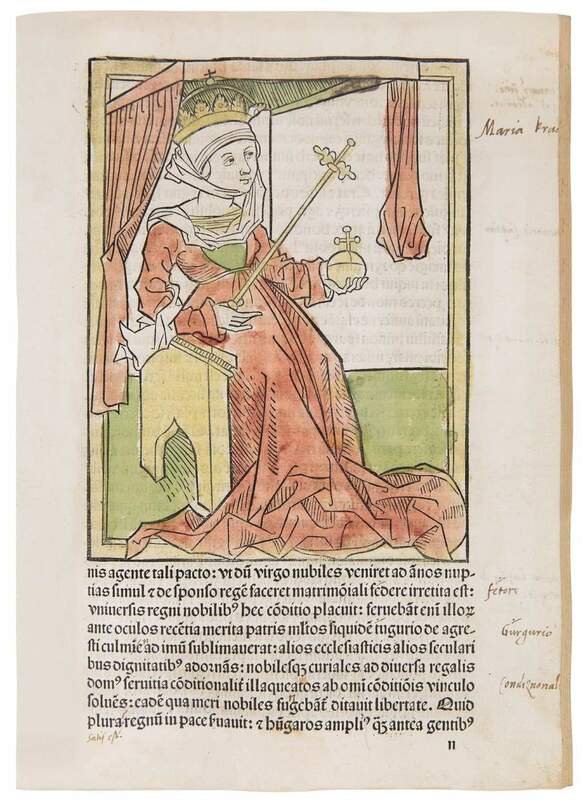 This first edition was very soon followed by a second edition, only 75 days later (Augsburg: Erhard Ratdolt, 3 June 1488, also available at Dr. Jörn Günther Rare Books). The work opens with a large woodcut (139 x 236 mm; leaf 1b) showing the land grab of the Hungarian tribes. The text is further illustrated with 41 coloured portraits of Hungarian kings and military leaders, all enthroned, the kings with sceptres and orbs. Especially remarkable and attractive are the portraits of the great patron of humanism and manuscript collector, King Matthias, and the solitary female, Queen Maria. The anonymous artist might have been in contact with the author, as the attributes of all figures are used correctly. This edition was promoted by Johannes Filipecz, Chancellor to King Matthias and also the promoter or even the founder of the first printing workshop of Brno (Moravia). The small workshop, run by the printers Conrad Stahel and Matthias Preunlein, produced only 9 books from 1486 to 1499. The Chronica Hungarorum is Stahel and Preunlein's only illustrated book, and it is extremely rare on the market.